Should You Buy Or Build Your Email Marketing Solution? The answer here is…it depends on what your pain points as an email sender are. If you’re technically proficient, sometimes going with an ESP seems like overkill. On the other hand, a good ESP provides help with email creation, list segmenting, campaign reporting, and with email deliverability. DIY - Has to find an ISP vendor, setup and configure mailserver software. Make sure domain has the proper DKIM, Domain Keys, SenderID, SPF settings enabled. Warm-up IP addresses if not sent from before. IP address reputation is unknown. ESP: Configuration has been done. IP address reputation is known. You should be advised as to what domain authentication has been done/is appropriate. DIY: Has to code email, validate email coding for text and HTML, configure email lists and email suppression files, and upload email code and email address lists to MTA software which requires technical and design knowledge. Has to create unsubscribe feature and possibly email delivery preferences features. Harder to do field insertion for email personalization. Harder to segment lists and emails for email testing and personalization. ESP: Probably has in-app pre-created email templates, email validation services for text and HTML, easy email address import and email suppression features. Most likely has unsubscribe page and email delivery preferences features. Easier to do field insertion for email personalization. Easier to segment lists and emails for email testing and personalization. Personnel doesn’t need as much technical knowledge to use service. DIY: If MTA software doesn’t have deliverability reporting, probably has to rely on Web server analytics to track opens using tracking .gif and/or Google Analytics to track clicks & Web behavior. Would have to compile unsubscribe and bounce reports manually. ESP: Should have deliverability reports for opens, clicks, and bounces. Would still use Google Analytics to track clicks & Web behavior. Would get easy to access lists for unsubscribes and bounces. DIY: Spam complaints are dependent on how the ISP deals with them and how bad the complaints are from upstream providers in particular. Self educate on CAN-SPAM. Would have to deal with blacklist maintainers and network operators on a one to one basis. ESP: Generally proactive in educating users on CAN-SPAM, and most ESPs will kick off service if too many complaints since their overall deliverability will degrade. ESPs usually have devoted deliverability personnel and good relationships with industry organizations, blacklist maintainers, network operators, etc. Just How Do Email Servers Detect Spam? Now how do anti-spam software/services detect spam? They primarily utilize different methods including content-based message encoding and keyword filtering rules, email authentication rules (if the sending server has SPF/DomainKeys/DKIM/Sender ID enabled), mail server IP blacklists, and domain blacklists for sending domain and email content. When a new email arrives on your mail server, it is initially evaluated against the IP and domain blacklists and for email server authentication status, and then for the email content rules. Usually, if the email scores higher than a preset criteria (for most services, an administrator can set scoring criteria) the email is marked as spam and dealt with appropriately. Note: To reduce server load, spam filtering services will outright reject email that arrives from IPs or domains on blacklists (this is why ensuring the sending IP and all domains are not on blacklists is so important). They also might reject or delay email if you are an unknown email sender violating email sending limits (this is called greylisting). These tactics are designed to relieve email servers from abusive email spammers who try to send as many spam emails as they can in a short amount of time. The most common spam filtering software is SpamAssassin, and many other popular spam filtering software/services use SA as a primary source. Other popular spam filtering services include Barracuda (hardware device based), Cloudmark, and a variety of MS Exchange based products. What Is An Email Suppression List? In addition, your organization’s email suppression list should be shared in the following situations: if you use a third-party provider for email marketing or if a partner executes a marketing campaign on your behalf. In these cases, you would provide your email suppression list prior to the launch of any marketing campaign so those suppressed email addresses can be scrubbed. In the US, the CAN-SPAM Act allows organizations to take up to 10 business days to add unsubscribes and opt-outs to the suppression list, so it’s in your best interest to keep the list updated as soon as possible, if not in real time. Most email marketers know they can track email opens, clicks and bounces. However, there’s a second common email marketing question: Can I see if my email lands in my recipient’s inbox or junk folder? You can try what’s called “email seeding” or putting email addresses from various Email Service Providers onto your email lists so you can monitor where your email lands on each service. A quick do it yourself way would be to have accounts on Gmail, Yahoo, Hotmail/Outlook, etc. and add those to your lists. I would also make sure to have seed accounts running Sendmail with a default SpamAssassin setup and a Microsoft Exchange with Outlook client setup, as these are the two most common private email server configurations. Many third party spam filtering solutions are based off of SpamAssassin filtering rules. The disadvantage to the DIY approach is that you wouldn’t have direct access to private or corporate email systems. Professional email seeding services like Return Path, have a farther reach and claim to have access to a large number of ESP seed accounts. Topic inspired by this Quora thread. If you’re a Web-based service which requires your users to log in to unsubscribe or to change email preferences, I think you deserve your place in the spam folder. Even moreso when your service fails to send password reset emails due to email deliverability issues and you require users to log in to use your Web site’s help functionality. When I read this blog entry by trimMail, I thought something was a bit amiss, (I mean besides the fact some email delivery company was complaining about the problems with Yahoo mailservers). As it turns out, the discussion on Slashdot has been pretty enlightening. My one takeaway is the comment about Yahoo’s use of greylisting, which from what I know about Yahoo delivery, sounds like it’s on target. Basically, if you act like a probe (like the trimMail mailserver tool monitoring port 25), you’ll get greylisted while if you act like a legitimate MTA and resend later, you shouldn’t have problems. 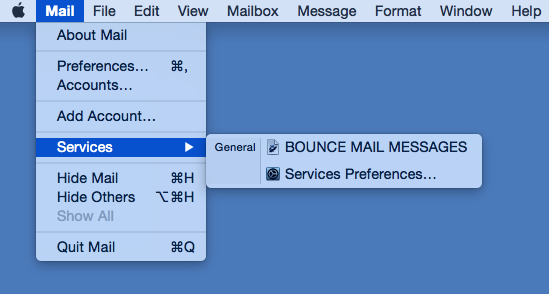 I use Thunderbird on Windows at work for my email needs, and I am just wondering why Thunderbird doesn’t support message bouncing like god’s given mail.app does.